Roux-en-y divided gastric bypass (RYGB), while effective in reducing mortality and morbidity in obese patients is associated with a 1-5% overall anastomotic complication rate including leaks and strictures. These complications have been traditionally treated with a combination of drainage, enteral/parenteral nutrition, endoscopic balloon dilatation and gastro-jejunostomy revision. There has been some suggestion lately that trans-anastomotic stenting may be a safe alternative to repeat dilatations and revisional surgery for anastomotic strictures with 33-84% success rate. We performed a retrospective chart review of patients that underwent trans-anastomotic stent placement in our institution between 04/2009 and 06/2010 for anastomotic stricture at the gastro-jejunostomy. All of these patients had failed multiple prior balloon dilatations. These procedures were performed by one of two surgeons in the operative suite with the patient under general anesthesia with fluoroscopic and or endoscopic guidance. A total of 8 procedures were performed on 7 patients using Boston Scientific Wallflex® partially and fully covered stents, and Alimaxx® fully covered stent. The median time from the index procedure was 138 days (range 52-2555 days). There were 4 fully covered stents and 4 partially covered stent placed. The mean diameter of the stent was 21mm, with the 23mm diameter stent being the most commonly used one. The mean length of time between placement and removal of the stent was 22.7 days. The overall short term success was 37.5% while the long term success (>6months) was 25%. 5 out of 8 (62.5%) procedures were followed by gastro-jejunostomy revision while one patient required a gastrostomy tube placement for feeding access and may require further procedures. 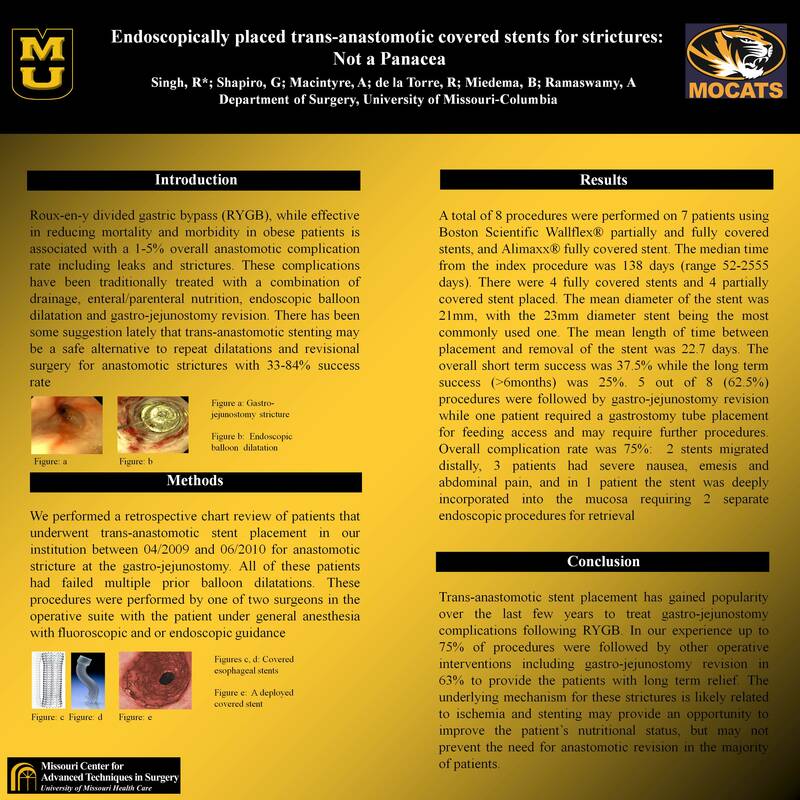 Overall complication rate was 75%: 2 stents migrated distally, 3 patients had severe nausea, emesis and abdominal pain, and in 1 patient the stent was deeply incorporated into the mucosa requiring 2 separate endoscopic procedures for retrieval. Trans-anastomotic stent placement has gained popularity over the last few years to treat gastro-jejunostomy complications following RYGB. In our experience up to 75% of procedures were followed by other operative interventions including gastro-jejunostomy revision in 63% to provide the patients with long term relief. The underlying mechanism for these strictures is likely related to ischemia and stenting may provide an opportunity to improve the patient’s nutritional status, but may not prevent the need for anastomotic revision in the majority of patients.